It is a point of historical interest that St. Paul ordered his letter to Colossae be read in Laodicea, and his letter to Laodicea be read in Colassae [Colossians 4:16]. 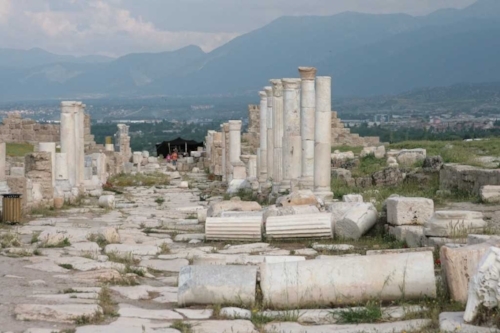 His letters clearly indicate that the Christians in the three neighboring cities of Colossae, Hierapolis, and Laodicea were secure. Christ began his address to the bishop with the phrase, “Thus saith the Amen,” which refers to the Old Testament formula, “Thus saith the Lord,” a formula used by the prophets to introduce a message, which would contain, at least, in part, statements from God about his activity in the future. The Church ends a prayer, creed, or other formal statement, with the term “Amen” to express solemn ratification [so be it] or agreement [it is so]. The Hebrew word “amen” literally means “certainly” or “certainty.” By the time John received the Apocalypse in 95-96 AD, the Amen was familiar to anyone who had read the gospels or had heard them read, because, as is recorded in the gospels, Jesus used it, frequently. Indeed, he made the Amen personal to himself, as he did the “stone” or “rock” in Daniel 2; therefore, the term is inseparable from him as the Mystery of the God, whose purpose is to bring the “kingdom of the heaven” over the whole earth. He who takes an oath in the land shall swear by the God of truth; for the hardships of the past shall be forgotten, and hidden from my eyes. Behold! I am about to create a new heaven and a new earth; the things of the past shall not be remembered or come to mind. And I saw a new heaven and a new earth. For the first heaven and the first earth passed away and the sea is no more. And I saw the city the holy [one] New Jerusalem coming down from the heaven from the God, prepared as a bride adorned for her husband. Thus, the term “Amen” connotes the renewal of all things; and the phrase, “Thus saith the Amen,” means that Christ swore by himself: for he is the new Adam, “the witness faithful and true,” and “the beginning/origin of the creation of the God,” who has all power and authority to bring the Father's plan to fulfillment. c) and, most especially, for the Church in the time of the seventh trumpet. Bear in mind that Christ deliberately made the message to Laodicea letter number SEVEN. His words were most solemn; the Eternal Truth and Certainty uttered them to Laodicea and, in fact, to the Whole Church for all generations to come. To the bishop, to everyone, Christ has delivered the ultimatum of either life or death, with little time left to choose--forever. and, in turn, the condition or state is to be understood as measured according to only one model or standard: Jesus Christ. He is the exemplar omnibus [the example for all], the one who persevered perfectly in obedient love, who faithfully and truly kept the two great commandants, even to death on the cross. It is plausible that Christ had in mind the nearby city of Hierapolis, for the descendent temperature of the waters of its springs, from hot to lukewarm to cold, corresponds with the descendent terrain: from Hierapolis on the mountain of Salbacos, to the plateau lower down, to the cliff; and these things aptly represent the bishop's situation. In the Bible, “water” symbolizes spiritual life. Lukewarm “water” can provoke nausea; hence, the tepid bishop is nauseous to Christ. The bishop is midway between the “sacred city” higher up on the “mountain” and the “fall” over the cliff. He has reached a plateau in his spiritual life, in the sense that he does not seek to advance in sanctity. He regards himself as levelheaded; and, what Christ considers nauseatingly neither “hot” nor “cold,” the bishop deems well-balanced and comfortable and not fanatical, but reasonable. In the bishop's heart is secret pride and arrogance: that the riches he has are HIS; that the prosperity he enjoys was achieved by HIM; and, therefore, nothing is needed by HIM. Thrice did Christ repeat the idea of “I,” hinting that the bishop is not God, and that he has no authority to give the name “good” to anyone or anything. Adam and Eve tried that. A man, by means of himself alone, cannot be or become good. The bishop's words, “I have need of nothing,” express what Christ abhors: self-exaltation. The insolence, the insult, of that word “nothing”!!! For such is the speech of sin, that Christ is--nothing. The letter's contents, emphatically, the phrase, “at the door,” and the clause, “I am about to vomit you out of my mouth,” are most especially applicable to the Church in the generation or two or three before the advent of the Beast of Chapter 13. Only the spiritually ignorant think that so much scientific knowledge, being used to make so much material wealth in the world, is not dangerous. Indeed, it will give rise to Babylon the Great.